My sisters are in town for some birthday and Father's Day celebrating, and one of my sisters brought me some nail jewelry from a huge flea market near her town of Clemson, SC. I can't remember the name of the town it's in, but she's sent me nail polish from there also. We don't even have a flea market around here, so it's always fun to see what she finds there. I decided to try one of the pieces out with Cult Nails Devious Nature, a beautiful berry pink creme shade. The formula on this is absolutely perfect. It was opaque in one coat, but I'm going to wear this for a while so I went with two coats. 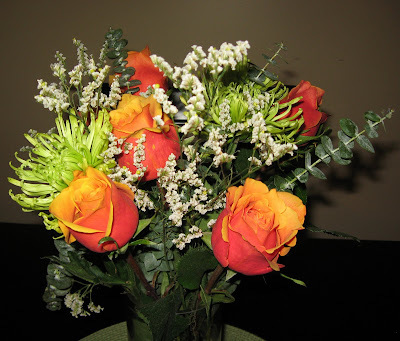 Here is the lovely birthday bouquet they brought me! They also brought me a necklace from Tiffany, so even though my birthday isn't actually until Monday (which I share with the awesome Kellie from the blog Also Know As, only decades apart! Yeah, I'm old! ), it's been very exciting and fun so far. I'll have to paint my nails with China Glaze For Audrey now that I have a Tiffany box to compare it to~ha-ha! 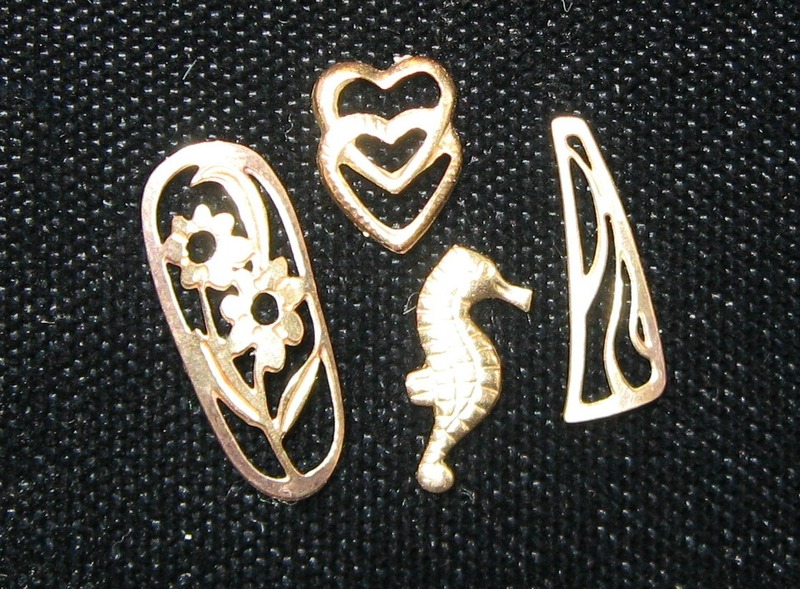 These are the nail adornments, and I just love the little sea horse. My sister said she saw them and had never heard of 14K nail jewelry, so she thought it would be something I could show on my blog. She wondered if anyone had ever seen these. I surely haven't, but if someone wants to gift me 14K anything to share on my blog, I'm fine with that! The box says "Genuine Sweet Lady Jane 14K Nail Jewelry". The vendor told her to apply them on wet polish and them seal them with a top coat. I think I put it on upside down, so I rotated this photo. Happy Birthday! Seems like it will be a great weekend! 14k nail jewelery & Tiffany's? Nice! I have never seen nail Jewelery like this either. Very cool. Those look really cool! I would be paranoid about losing them, too. And Devious Nature is gorgeous! My Cult Nails order is out for delivery today and I'm so excited! Sounds like you got some lovely items for your birthday. Those are so cute! I hope you have a super awesome birthday!! Happy Birthday and I would've applied it the way you did, facing me....LOL! Love this shade, but I am a sucker for anything in the berries that lean toward fuchsia range. 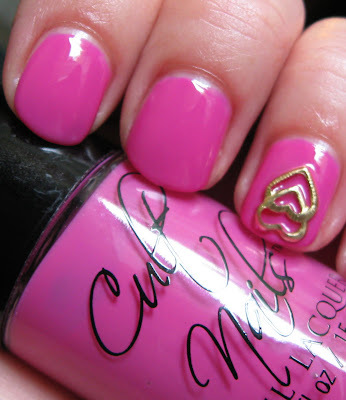 I just adore fuchsia polishes of all tints/hues (except for neon). Love the charms. 14K gold is the standard for gold in the USA. Italy it's 18K. Ireland it's 9K. The lower the # the harder the alloy mix is with the gold leading to less bending, denting, etc. 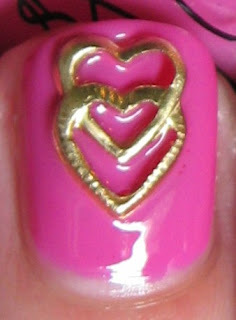 I have seen these kind of 14K nail charms. 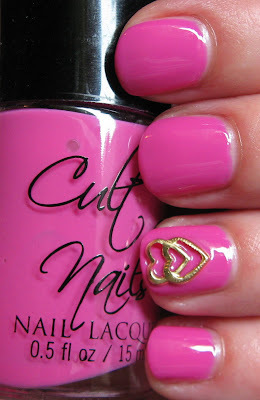 There are some with the iconic CC for Chanel which are very popular. I would have to dig for the link to the last site I saw them sold on. 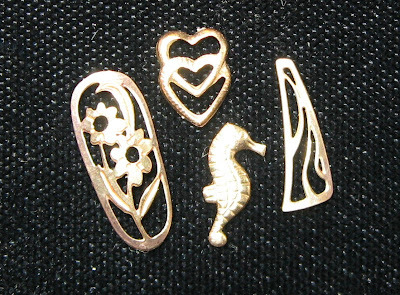 But there are a lot of these 14K gold charms around. I do really like the large one that looks as if it would cover a full long nail (I never let my nails get that long anymore - liking the shorter look and no more acrylics ever for me). Happy b'day you old girl....enjoy! Oh and save that Tiffany box. Some can become collectors items over time as they make little changes to them. I had 24k nail jewelry years ago, 24k is softer than 14k so its more bendable to fit the nail. I loved them and wore them for years, never had a problem with losing them. Only problem is I can't remember where I purchased them and have not been able to find anymore. I'm talking over 20 years ago so there's no way I can remember where they were bought at. Love the charms! I just recently received an order from Cult Nails. Very nice polish. Hope there will be many more shades to come. The flowers are beautiful.